It is a real delight to join you for the China Europe International Business School Third Europe Forum 2017. Let me begin by extending my warm congratulations on the opening of the Forum. Since its founding 20 years ago, China Europe International Business School has been true to its motto of "Conscientiousness, Innovation and Excellence". Your have trained a large number of talents who have gone on to become well-known economists. They are the embodiment of the CEIBS objectives, namely, "China Depth, Global Breadth". Through them, the CEIBS has contributed your part to China's economic and social development, and you have played an active role in the business cooperation between China and Europe and beyond. 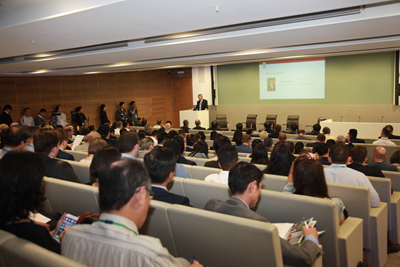 The focus of this year's Forum is on the "Belt and Road Initiative: How the UK Benefits from China's Economic Growth". This focus cannot be more relevant and meaningful. The host asked me to talk about the significance of the Belt and Road and the opportunities it will bring to China-UK cooperation. So let me share with you some of my observations. The Belt and Road Initiative was proposed by Chinese President Xi Jinping in Autumn 2013. This Initiative marks a major step in China's overall opening-up. It is more importantly a public good to boost regional and global development. Four years on, this Initiative has enjoyed increasing recognition from countries along the Belt and Road. It has gathered growing international consensus. Four main reasons explain how. First, the Belt and Road Initiative is a concrete endeavour in building a community of shared future for mankind. Looking around the world today , we see fundamental changes that are unprecedented for centuries. Multi-polarization, economic globalization, IT application and cultural diversity are gaining momentum. Inter-connection and inter-dependence has increasingly become a salient feature of the human society in which the future of mankind is shared in a big community of nations. Meanwhile, deep-rooted problems such as peace deficit, development deficit and governance deficit are calling for immediate solutions. Regional hotspots are causing instability. Terrorism is going rampant. Conventional and non-conventional security challenges keep emerging. It was against this background that the Belt and Road Initiative was proposed. This Initiative aims to build a shared community of mankind. To achieve this, it takes on the fundamental problem of development by means of stronger policy coordination, infrastructure connectivity, unimpeded trade, financial integration and people-to-people bond. It points out the way forward with regard to addressing a series of key problems in the world today. And it seeks to provide answers and solutions to these problems. The Belt and Road Initiative is committed not only to economic integration and common development for all partners involved. It also seeks to strengthen world peace and stability. It is the path to the community of shared future for mankind. Second, the Belt and Road Initiative strongly advocates an open world economy. At the moment, the world economic recovery remains sluggish. Anti-globalization and protectionism are on the rise. But this will not hold up the pace of open and inclusive development around the world. In President Xi's words, "for a country, opening up is like the struggle of a butterfly breaking free from its cocoon. There will be short-term pains, but such pains will create a new life. " For the past four years, projects under the Belt and Road Initiative have always been open and committed to an open world economy. The long-term vision of this Initiative is a massive belt of economic growth unprecedented in span and coverage. It aims to link up the vibrant Asia-Pacific in the east with well-developed Europe in the west. It encourages openness and stimulate growth. It helps to build a fair, reasonable and transparent international trade and investment regime. It strives to facilitate the orderly flow of production factors, enable efficient allocation of resources and lead to a higher degree of market integration. It seeks to enhance domestic development in participating nations and close income gaps. It will make economic globalization more inclusive and deliver benefits to more people. Third, the Belt and Road Initiative encourages diversity and innovation. Through this Initiative, the ancient Silk Road spirit will live on. Instead of seeking uniformity, it emphasises harmony and embraces different ideas. This is very much an expression of the cultural thinking found in Asian civilisations. Any country, along the ancient Silk Road routes, or outside this region, is able to participate in the Belt and Road Initiative. By seeking multi-level, broad-ranging people-to-people ties, this Initiative encourages exchange and cooperation in education, science and technology, culture, health, tourism, sports and so on. Cooperation in these areas will increase mutual understanding, build mutual respect and forge friendship. Therefore, the Belt and Road Initiative is not meant to replace or to exclude. Rather, it aims to build on whatever cooperation that is already in place and help countries along the Belt and Road routes to align their development strategies for common progress. Last May, the Belt and Road Forum for International Cooperation was successfully held in Beijing. The Forum produced a long list of deliverables. The list includes projects under five categories, 76 multi-lateral and bilateral agreements and 270 specific outcomes. Participants agreed to stay committed to innovative development within the Belt and Road framework. They agreed to explore new models and new platforms of investment and financing. They also agreed to support action plans on e-commerce, digital economy, smart city and hi-tech park. The Belt and Road Initiative believes in diversity and creativity. Everyone can be a partner, whether it is a country, an international organization, a multinational company, a financial institution or an NGO. The diversity and creativity within the Belt and Road community is showing its great strength. This will continue to drive inclusive and vibrant growth along the Belt and Road routes. Fourth, the Belt and Road Initiative is a demonstration of China taking the lead to advance win-win cooperation. The concept of the Belt and Road is proposed by China. But the benefit of the Initiative will be shared by all. This Initiative will encourage closer international cooperation. It will align China's development with that of the countries along the routes. And it seeks to realize win-win cooperation that China has always advocated. China worked with relevant countries to set the Guiding Principles on Financing the Development of the Belt and Road. China contributed an additional 100 billion RMB to the Silk Road Fund. Financial institutions are encouraged to conduct overseas RMB fund business with an estimated amount of 300 billion. 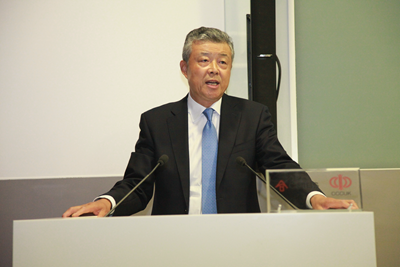 China is going to host China International Import Expo annually starting from 2018. These measures will effectively align policies and development strategies of the partner countries, enhance cooperation on big projects and step up financial support. The Belt and Road Initiative is a platform for interactions between China and the world. On this platform, China stands ready to share with other countries its development experience as well as development benefits. But China will not interfere in other countries' internal affairs, nor will it export its social system or development model. In state-to-state relations, China will work for the new model of win-win cooperation, rather than the outdated geopolitical maneuvering. China aims to create a big family of harmonious co-existence, not a small, exclusive group that is detrimental to stability. These measures and commitments demonstrate China's leadership and accountability as a responsible, big nation. Britain is a country of global influence. It has an important role to play in regional and international cooperation. It is also a key partner for China in building the Belt and Road. Thanks to the concerted efforts of both countries, the British public is gaining a deeper understanding of the Belt and Road Initiative. Over the past years, the business community, think tanks, universities and research institutions across Britain have shown great enthusiasm. They have published reports on the Belt and Road and made suggestions on China-UK cooperation under the Belt and Road Initiative. I am pleased to see China-UK cooperation on the Belt and Road is gaining momentum. The future for such cooperation is bright. The opportunities ahead are immense. This is particularly true in three aspects. First, China and Britain have clear-cut political consensus. In October, 2015, President Xi Jinping's successful state visit to Britain heralded the "Golden Era" of China-UK relations. Building the "Golden Era" meets the common aspiration of the Chinese and British people and serves our two countries' long term interests. One of the important agreements coming out of that visit was to form closer synergy between Chinese and British development strategies. This includes expanding cooperation on the Belt and Road, and this is a "golden fruit" in this "Golden Era". Prime Minister May said on many occasions that China-UK cooperation on Belt and Road has broad prospects and will deliver fruitful results. During the eighth China-UK Economic and Financial Dialogue last year, Britain's role as a key partner in the Belt and Road building was clearly defined. In May this year, Chancellor Hammond attended the Belt and Road Forum as Prime Minister May's personal envoy. He said at the Forum that "Britain, lying at the Western end of the Belt and Road, is a natural partner in this endeavour." These shared political commitments pave the way for China-UK cooperation on the Belt and Road. 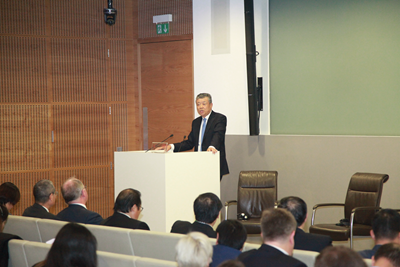 Second, China-UK cooperation has a solid foundation. At the policy level, Britain is the first major Western country to apply to join the Asian Infrastructure Investment Bank. It is also among the first to approve and sign the Guilding Principles on Financing the Development of the Belt and Road during the Belt and Road Forum. In key projects, Hinkley Point C saw the placement of the first structural concrete at the technical galleries of the plant. Last month, the ABP Royal Albert Dock broke ground. This project will bring to Britain 1.7 billion pounds of investment from China. In trade and investment, the first five months saw trade in goods between China and Britain increase by 6.5%. China's non-financial direct investment in Britain stands at 18 billion US dollars, far outnumbering that of any European country. In people-to-people exchange, the enthusiasm remains high. The number of twin cities increased to 60. Annual mutual visits exceeded 1.5 million. It is especially notable that, in January this year, a freight train of the China Railway Express made the first round trip between Yiwu and London. This was the very first time that China-UK trade is completely connected by land transportation. It also means that the China Railway Express has completed the "last mile" in its journey to the very western point of the Eurasian continent. The concrete progress has cemented the foundation for further China-UK cooperation on the Belt and Road. Third, the respective strengths of China and Britain make a perfect match. In building the Belt and Road, China and the UK have every reason to join hands. The UK has experience, knowledge and creativity. China has a unique growth model, technology and market capability. China and the UK working together would enable a perfect match of our respective strengths. One area is the financial sector. The building of the Belt and Road requires not only investment and financing cooperation but also financial services. China is working to build a financial service platform in countries along the Belt and Road. Britain has a modern, advanced financial service sector and maintains close financial ties with many Belt and Road countries. The City of London is a global financial center. It is home to the greatest number of foreign banks' branches or offices and almost 40% of global foreign exchange interactions take place here. China and Britain will find huge untapped potential for financial cooperation with countries along the Belt and Road. In terms of legal and consulting services, Britain also has unique advantages. Britain is a world leader and the origin of the common law. Britain has mature professional services sector especially in laws and consulting. British leadership in international commercial arbitration and dispute settlement is widely acknowledged. By strengthening communication and cooperation, China and the UK could provide strong legal and consulting services and facilitate the building of the Belt and Road. Britain's strength can also be found in education and research. Britain has a unique advantage, namely, the English language. But that is not all. Britain is also home to numerous prestigious think tanks, universities and leading R&D and innovation institutions. With only 1% of the world's population, Britain accounted for 3.2% of global R&D investment and 4% of the world's R&D research staff. Papers published here in this country accounted for 6.4% of the world's total and 11.6% of world-wide citations. China and Britain can join hands in providing intelligence support to the Belt and Road. China and Britain can also be engaged in cooperation with other countries along the Belt and Road. Britain has close historical and cultural links with quite a number of countries along the routes, especially the Commonwealth nations. British businesses are experienced and well-based in market development, project management, project monitoring and risks control in these countries. These are exactly what is needed in the Belt and Road projects. By joining hands to explore the market of a third country along the routes, China and Britain can achieve more than "one plus one". The China-Pakistan Economic Corridor is such an example. If the Belt and Road Initiative is a grand symphony, the China-Pakistan Economic Corridor is its first movement. It is a successful case in term of implementing the Belt and Road principles, namely, extensive consultation, joint contribution and shared benefit. This corridor has huge potential for future development. In last April, I attended the China-Pakistan Economic Corridor Roundtable Meeting hosted by the British Government. I was deeply impressed by the enormous enthusiasm of the British business leaders for the Belt and Road cooperation. British businesses are more than welcome to join in. We hope that the British side will give priority to the actual needs for building this Corridor. I hope Britain will leverage its strength and work with China and Pakistan. Together we can make our cooperation win-win for all. "The swan geese can fly long and safe through wind and storm because they move in flocks and help each other as a team." These words offer a lot of food for thoughts. They give us inspiration. This year marks the 45th anniversary of China-UK Ambassadorial diplomatic ties. It is also a year for consolidating the "Golden Era" of China-UK relations. As we reflect on the achievements of the past 45 years and look into the future, our two countries have every reason to work together as a team. and a partnership that will deliver more to the people of our two countries and beyond. In conclusion, I wish the CEIBS Third Europe Forum a complete success!